The danger of excessive water nitrates to aquarium fish is often misunderstood by aquarium hobbyists. Although far less toxic than ammonia or nitrite, high nitrate levels—called nitrate poisoning or nitrate shock, can still kill aquarium fish. Chemically, nitrates are similar to nitrites, in that both consist of molecules of oxygen and nitrogen. Nitrites, however, contain two atoms of nitrogen for each one atom of oxygen, while nitrates contain three nitrogen atoms for each atom of oxygen. Nitrate is one of the natural byproducts of fish digestive wastes and can build up in a tank that is not maintained properly. Nitrate poisoning occurs when fish are exposed to gradually rising nitrate levels over a period of time. This typically happens when regular tank maintenance is not performed. Overfeeding and overstocking are also significant contributors to rising nitrate levels. If steps are not taken to reduce nitrates, the cumulative effect can be fish death. Some fish will be affected by levels as low as 20 mg/l, while others will show no apparent symptoms until levels have reached several hundred mg/l. Immature fish are affected at much lower levels, as are saltwater fish. Nitrate shock occurs when fish are suddenly exposed to a vastly different level of nitrate, often by as much as several hundred parts per million. Although nitrate shock usually happens when fish are suddenly exposed to a much higher level of nitrate, fish can also be shocked if nitrate levels suddenly drop dramatically. As with nitrite poisoning, immature fish and certain species, such as Discus, are more sensitive to sudden changes in nitrate. If nitrates have risen slowly over time, it is not unusual for only one or two fish to exhibit symptoms initially. Unless water tests are performed, there is no apparent reason for the why the fish mysteriously became ill. If nitrate levels are not reduced, more fish will begin to show symptoms. Eventually, fish death will begin, occurring over a period of a few days to a few weeks. When fish are suddenly exposed to very high nitrate levels, they will usually die within 24 hours of exposure. Often owners are not aware of the problem until the fish are either dead or near death. In these situations, there is little that can be done for the affected fish, but recognizing it can avert further tragedy before new fish are added to the tank. Most cases of sudden nitrate shock and subsequent fish loss occur when bringing a new fish home to an aquarium that has drastically higher nitrate levels. Although nitrate shock can occur when moving fish between aquariums at home, this is less common, because owners typically treat all their aquariums in the same manner, resulting in similar water conditions in all tanks. Nitrate shock can also occur when massive water changes have been performed on a mature tank that has high levels of nitrate. The sudden drop in nitrate can shock the fish. Even in cases of sudden exposure to high nitrates, it is possible to reduce the effect of the nitrates, thus giving the fish a fighting chance of survival. The key is to avoid another sudden change. Ideally, nitrate levels in a freshwater aquarium should be kept below 20 mg/l. However, any changes should occur slowly, at a rate of change that is less than 50 mg/l change per day. Perform multiple small water changes. Perform a 5 percent water change every hour or two, using water that is low in nitrate. Continue until you have replaced approximately half of the volume of water in your aquarium. This process will reduce the nitrate levels significantly, but slowly enough to avoid the effects of sudden changes on the fish. After the final water change, test the water and note how much the nitrate level has dropped. If nitrate levels remain above 100 mg/l, repeat the process the following day. Nitrate-removing filter media can also be used if nitrate levels remain high. Reduce feeding. If your fish are being overfed, their digestive process will add excessive nitrate to the water. Make sure to feed just enough to keep the fish healthy. The nitrate levels should drop naturally once feeding practices are corrected. Increase aeration. Increase the aeration in the tank, as tanks with high nitrates are usually low in oxygen. Do not feed the fish for 24 hours, and then feed sparingly until the tank stabilizes. Once nitrates have been brought down, it is important to maintain the tank properly in order to avoid another nitrate disaster. Use nitrate-removing filter media. Special filter media can be used if other methods don't reduce nitrate levels. Ask about the recommended nitrate values before buying fish. The best way to deal with this scenario is to avoid it in the first place. Before purchasing fish, test your water and make a note of the pH and nitrate levels. At the fish shop, ask the clerk to test the water in order to verify that the pH and nitrate levels are reasonably close to what is found in your home tanks. If they aren’t close, don’t purchase fish until you can adjust your home aquarium to more closely match the source tank the fish experiences in the store. Keep live plants in the tank. Adding live plants to your tank is a great long-term preventive measure. 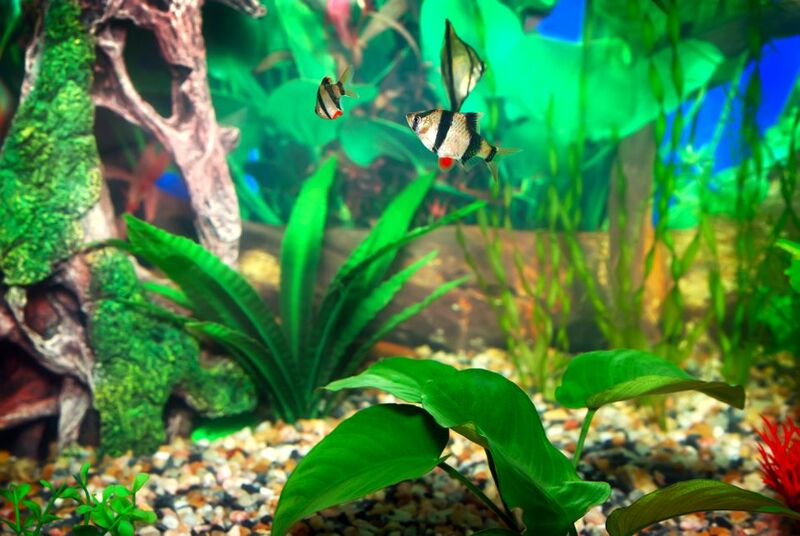 Live plants utilize nitrate, thus helping to keep nitrate levels lower in your aquarium. Do not overfeed; remove uneaten food promptly. Do not overstock your aquarium. More fish = more waste = more nitrates. Keep the tank clean. Good overall tank maintenance goes a long way towards keeping nitrates down. Perform regular filter maintenance. Regular cleaning and replacement of filter media will keep nitrates at bay. Use nitrate-removing filter media. If nitrates are a persistent problem, there is nitrate-removing filter media available.